When I was trying to explain the concept, title, and tagline of Verge of Verse during casual conversations with friends and family, a few people have asked me, “What does ‘in medias res’ mean?” It made me think about what to write next and do some more exploration about the creative direction in which I could take this website as we move forward into the new year. This literary term throws us into the heart of the story – the height of tension that serves as both the contextual backdrop and the propeller of plot. This then allows us to set up and analyze character development. Many stories are told in medias res. Homer used this narrative technique in The Iliad and The Odyssey. The Roman poet Horace had suggested to Homer that the starting point for his epic poems should be in the middle, rather than at the beginning. 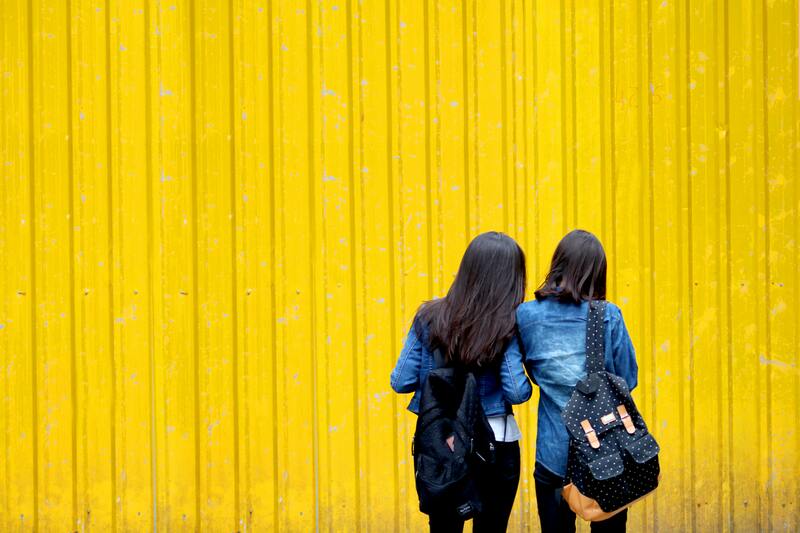 It’s more effective as a narrative storytelling technique, especially when you’re crafting long stanzas of poetic verses. Rather than roaming through the origins of each character and inducing boredom within readers, this technique allows us as the audience members to feel intrigued about Achille’s bravery in battle and the travails that Odysseus must triumph over during his travels. This allows us as the audience to dive straight into the foray that is already unfolding as we join the heroes on their journeys to fulfill their quests. While I am no writer of epic poetic narratives, I want to use this space to write about things that I find exciting and interesting through exploration of my own creative perspective. I envision Verge of Verse to be a work-in-progress. I like using the phrase in medias res as a metaphor for this website, as well as a personal mantra for my general outlook on life. Change is the only constant that we can count on, if only we choose to embrace it. 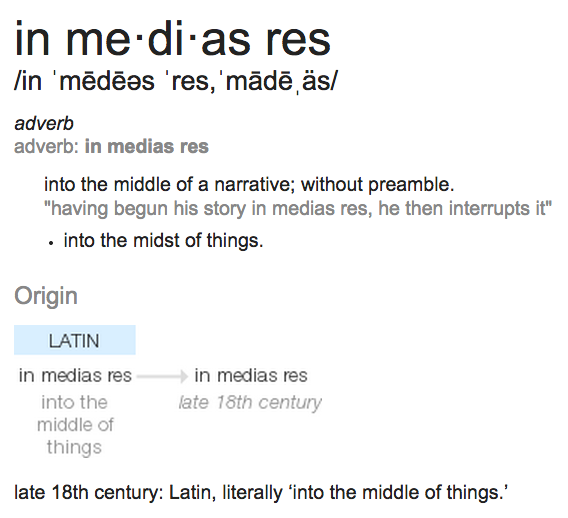 If you had no idea who I was, or who I am now, then you’re reading these posts – all part of a greater narrative – in medias res. As a writer, you’re always entering your characters’ worlds in medias res. I often dream up scenarios as they’re happening. I’ve never met the characters before. I’m only just starting to get to know them, based on what’s going on in the context of this made-up scenario. The characters intrigue me, and before I know it, I’m in for the ride. All because I really want to find out how they resolve their conflicts. I want to know whether or not they get a good ending or another chance at a new beginning. Of course, as the writer, it’s up to me to work out just how the details will play out in these characters’ lives. As for this website, I’m constantly in the middle of figuring the details out. I am also currently in the middle of trying to figure out the rest of my life. I am on my own trajectory, and though it is not quite as heroic or as dramatic as that of Odysseus’s journey, I still have to face the decisions of which chances to take and which choices to make. I am myself caught up in medias res, thrown into the middle of things, trying to keep afloat and rise above the challenges that I find myself having to confront. Throughout the process of creating this website, I constantly asked myself these questions and wondered what kinds of answers I could come up with, if any, to resolve them. Which direction do I want to take? Where do I want to take this project? A Muse Sings (which I later learned had a generic title, despite initially thinking that it was clever, since so many other bloggers and website owners used the word “muse” in their titles). It was a good start for someone who was completely new to blogging, coding, and publishing posts on the World Wide Web. Plus, I began using it as an outlet for creative writing and for my intermediate writing class at Hunter called “Expository Writing.” The adjunct instructor who taught the class, Laurie, told me that although I didn’t post all that often, I more than made up for it in the content that I did post. 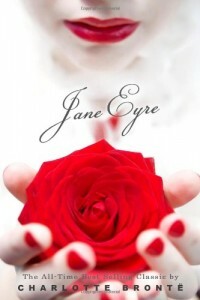 I thought I was a clever college student during its five-year run, especially since my followers liked my post about how appalling it was that publishers were marketing beloved classics like “Jane Eyre” in repackaged mock-up covers of the Twilight Saga just to boost book sales at the cost of ignoring each classic’s literary uniqueness and integrity. However, after graduating and receiving my Bachelor’s degree in Psychology, I decided to stop blogging on A Muse Sings. Life became busier as I started to adjust to my day job as a coordinator in a non-profit agency while also trying to figure out how to balance my social life, dating life, and family life. I was being pulled in different directions and didn’t have much of a focus to keep me grounded in who I was as a person. I just knew that despite feeling depleted by the end of the week, I still wanted to maintain my hobby as a blogger and a writer. 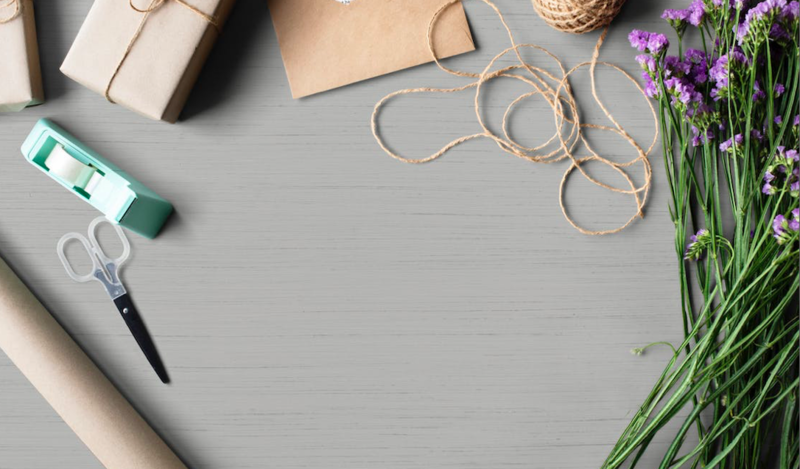 Change, I had decided, needed to happen, and so I began designing a new blog and writing content that I thought went in a direction that would finally make me happy. A Muse Sings of Ponderings became my next blogging project on Blogger. I know, the title is still a variant of the old one, but this time paired off with a cutesy word I made up known as a “pondering.” I worked on it since I started at my first ever job as a coordinator in a non-profit agency in 2012 up until early 2014, when I just wasn’t feeling the blog anymore. I was not thrilled about the name of the blog and could barely scrape up anything original. I also grew tired of having the blogspot.com extension in the domain. I wanted to own my own domain and host my own independent website. I wanted to start from scratch, rebrand, and rebuild. What better way than to switch to a different site platform? Thus, Verge of Verse was born. What topic(s) shall I write about today? 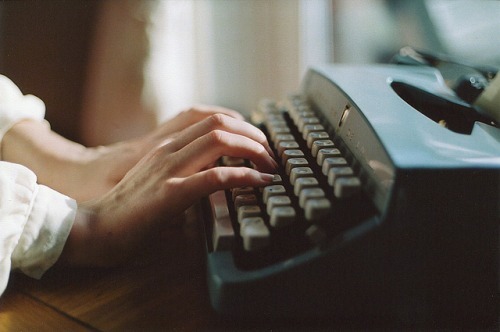 I don’t always know what I want to write on any given day, unless I have enough energy to write it. But I will always strive to write about topics that capture my attention. Even if it’s a topic that has been explored before, I like to explore my own perspective on a chosen subject of social discourse. Whether it’s a commentary on literature, an aside regarding an entertaining television show, the examination of the lyrical composition of a song, or just thematic photos and typography as motivational reminders for fellow writers and creatives, I want to make sure that the subjects I post about showcase substance, not just random compilations of whatever happens to be the musing of the moment. I’ve been using tags and categories to label my posts and content. It’s more for my own sake in terms of organizing subjects I bring up, but I find that they’re useful when I want to look back at something specific in the archives as I reflect on the progress of this project. To learn about which particular topics I am most passionate about, just glance over at the sidebar: creativity, writing, journalism, quotes, transitions, etc. More will be added in the future, as more things come up – in medias res, of course. 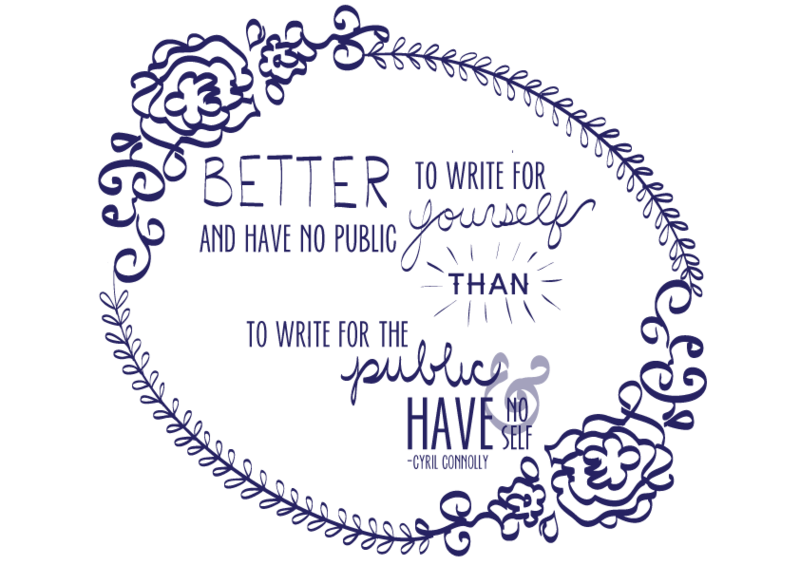 If I truly heeded Connolly’s take on artistic integrity, I would ultimately write for myself. I write because I want to create something new and different, experiment with basic elements of design and offer a fresh perspective on something that most people wouldn’t think twice about. 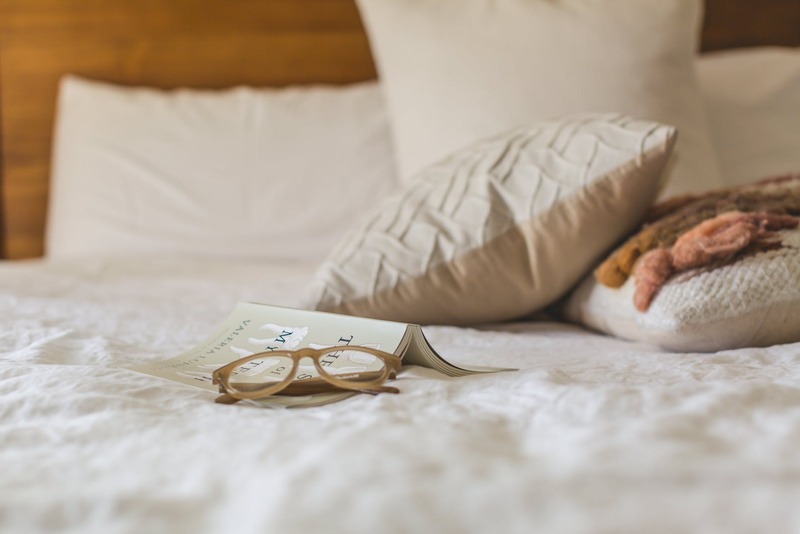 But if I am to take my honesty even further with answering the question, then I would imagine that any reader who stumbles upon this website and decides to stay is someone who shares similar interests and also craves that creative connection with others. I want to make Verge of Verse a comfortable niche not just for myself, but also for those who are seeking a brief respite from the stressors in their lives: young people like myself who are just learning about themselves and who they are, literature freaks and grammar geeks, spelling wizards, aspiring novelists, poets, and writers of all genres, bloggers, designers, photographers of various backgrounds and skill levels, artists and art enthusiasts, songwriters and musicians, actors and directors, media production professionals, foodies, and film aficionados. If you fancy yourself to be a creative person driven by purpose, aesthetics, and just living your life as passionately, beautifully, and as uniquely as possible, then by all means, welcome to the pages of Verge of Verse. If you want to collaborate on a piece or submit your own original piece for publication on the site, then I’d love to hear from you. Drop me a line: vergeofverse@gmail.com. How did I come up with the branding and design of the website? I used the free Graphy theme for WordPress and customized it until I was happy with it. I like that it was designed for people who appreciate simplicity, functionality, and beautiful typography. The Graphy theme is perfect for someone who loves how the written word is expressed both verbally and visually on a page or a screen. I then installed some practical plug-ins for website management: JetPack, Anti-Spam, Enhanced Text Widget, Shareaholic, to name a few examples. I set up my sidebar widgets so that the website can be organized (using tags, archives, and a list of recent posts) as well as engaging and inviting to site visitors by linking to my other social media platforms, such as Pinterest, Instagram, Bloglovin’, Twitter, and Facebook. I liked it at first, but the vintage corners were a bit much, and the tagline was just too long. And while I freely admit that I am a self-proclaimed geek, I did not feel comfortable including that word in the tagline anymore. I decided that the geek part was implied, especially since you’d have to be a geek anyway to know that the phrases “verge of verse” and “in medias res” are similar in concept. Both phrases suggest that one is on the cusp of creating something, discovering something, making sense of the density of the things that surround us. I loved the contrast between the structured typewritten font and the free-flowing cursive of lovely penmanship, but I still wanted to maintain that part of the design concept in the site header. So I did it manually instead of relying on a graphics software application to create a font: I wrote out the name of the website on a blank piece of paper using a black fine point Sharpie marker. I then snapped a photo of it on my iPhone 6 and made some adjustments to the image and added the tagline using PicMonkey. After saving the finishing touches, I uploaded the final version of the masthead to the site’s media library. There’s just something empowering about adding your own personal touch to a website you’ve been creating without having to rely so much on pre-made fonts to breathe character and life into your site. I like that my penmanship is neat and could (possibly) pass off as decent calligraphy in terms of branding and design. As for the favicon (the tiny icon on the corner of the browser tab next to the site name), I just decided to use a typewriter to showcase my love for words, the writing process, and aesthetic appreciation for typography. At the moment, I’m happy with the simplicity of the theme and web design of the site. 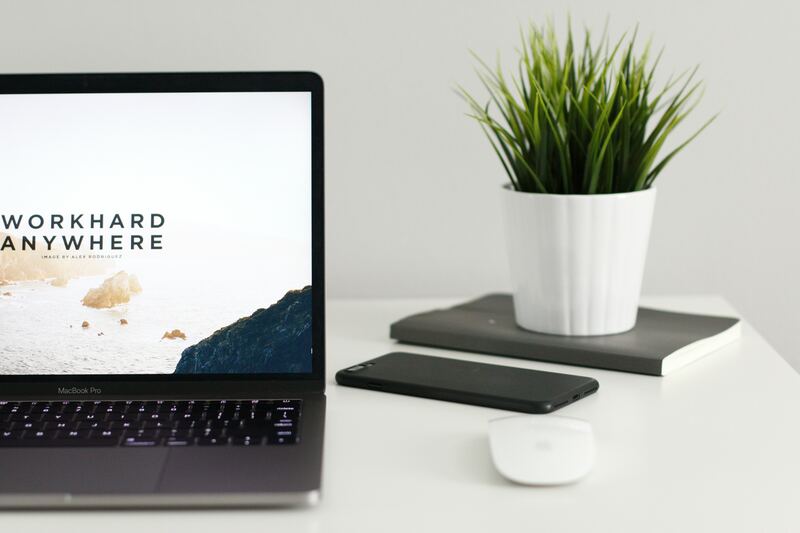 The black text against white background makes the overall reading experience easy on the eyes and clear from visual distractions so that readers can comfortably concentrate on the actual content. 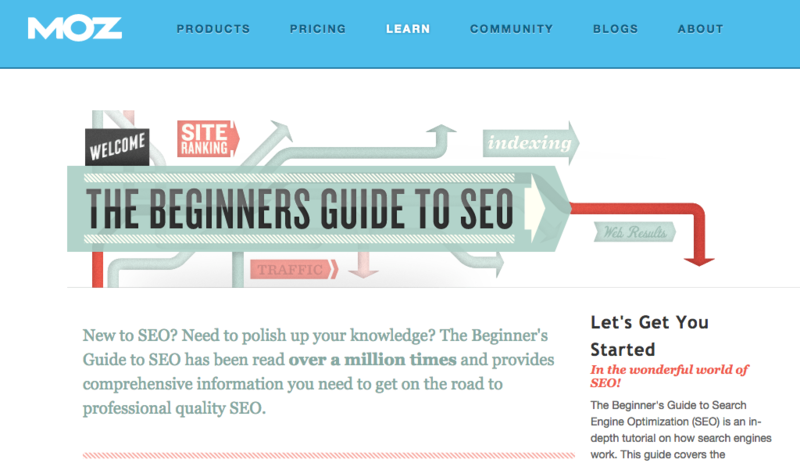 What does “SEO” stand for? How do I use it? If you want your website or blog to be more discoverable and shareable with others, then there are certain techniques you can apply as you update your content, such as setting up tags and categories as filters and keywords. You can create simple and unique URLs for your posts so that if someone types in the words “cake” or “baking” on Google, Bing, or Yahoo, for instance, your post title “Bake A 30-Minute Chocolate Soufflé,” will show up in some of the search engine results. I will be honest: I’m not a pastry chef, and I only possess rudimentary skills in baking. 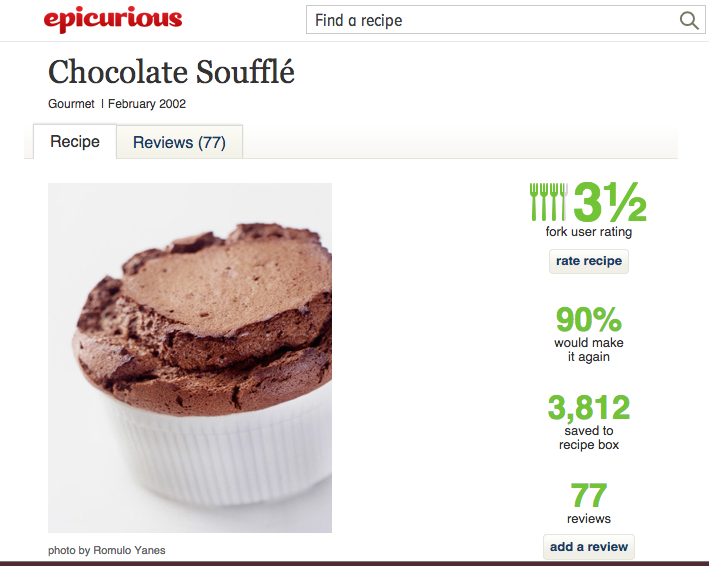 I really don’t know how to bake a chocolate soufflé, let alone whether it takes 30 minutes to successfully bake one, but I did do a quick search on Google.com to find out whether I can find a recipe using those keywords. The top results that came up, are theoretically, the most successful at SEO. I chose this recipe from Epicurious, since the total preparation and baking time is 45 minutes whereas the other sites offered recipes that took about 50 minutes to an hour. Click the image to get the recipe. It’s quite simple really: type keywords into the search engine to pull up the most relevant search results. You want yours to appear as close to the top of the results list as possible so that people can discover your content, and more importantly, allow them to explore your website before they decide they want to bookmark it and follow your posts. 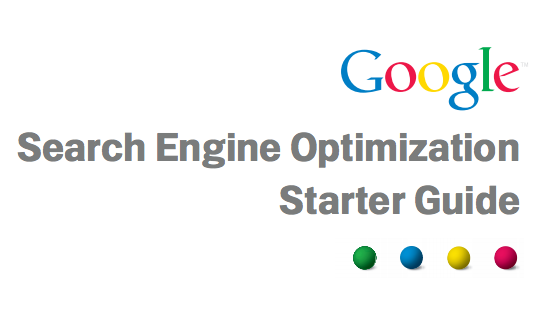 Another free guide for beginners seeking more information about SEO is brought to us by a marketing analytics software company known as Moz. Quite frankly, my attention is more drawn to learning from Moz’s simple guidebook instead of Google’s, simply because the graphics and visual design makes it easier for me as a novice to keep my attention focused on the most relevant information. You can interactively read it directly on the Moz website or you can download, save, and print the PDF version of the Moz SEO guide if you prefer. Aside from SEO, Moz has also some other free beginner’s resources that you can check out if you want to learn more about social media platforms and link building. Verge of Verse is still in its early stages, and I clearly still have plenty of reading to do in order to fully understand how to apply new and emerging concepts and techniques here. But I look forward to the process and the challenge. I get excited thinking about all of the books and articles I can delve into for smart tips, practical techniques, and new design ideas. Moving forward, I earnestly hope I can take the time to get more serious about seeing this project expand and evolve into something awesome that other people can also get excited about and feel that they can be a part of a creative community. 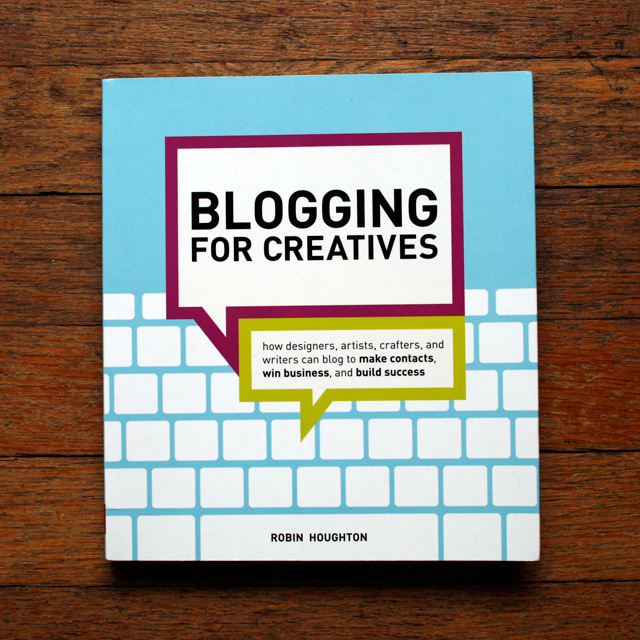 I’ve been using these two books as inspirational reference resources for blogging, website design, and creating content. 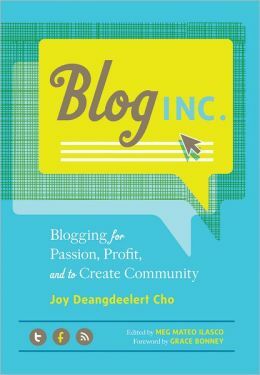 “Blog, Inc.” by Joy Deangdeelert Cho, from Oh Joy! I bought them at Barnes & Noble while checking out the writing reference and the social media/digital marketing sections of the store. They’ve been engaging, educational, and helpful guidebooks. 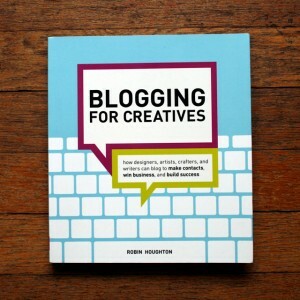 Even though I’ve been blogging and know the basics of content creation and what constitutes good web design, there are many other aspects to blogging and building a website that these books cover: how to create a community, monetize your site, develop affiliate relationships, using social media to connect even more with your audience, etc. All I know is, Verge of Verse will continue to be a work-in-progress as I figure out the rest of the details. It’s a metaphor not just for the emerging creation, but for the aspiring attitude and attempts that creatives like you and me each possess as we move forward, often breaking onto a new scene in medias res.